Meet Marian Diamond, one of the founders of modern neuroscience, and an inspirational teacher to thousands at UC Berkeley and to millions on YouTube. Meet Dr. Marian Diamond as she pulls a human brain out of a hatbox and lovingly enumerates its astonishing qualities. MY LOVE AFFAIR WITH THE BRAIN follows this remarkable woman over a 5-year period and introduces the viewer to both her many scientific accomplishments and the warm, funny, and thoroughly charming woman herself, who describes her 60-year career researching the human brain as "pure joy." As one of the founders of modern neuroscience, Dr. Diamond challenged orthodoxy and changed our understanding of the brain--its plasticity, its response to enrichment and to experiences that shape both development and aging. Her groundbreaking work is all the more remarkable because it began during an era when so few women entered science at all. Shouted at from the back of the conference hall by noteworthy male academics as she presented her research, and disparaged in the scientific journals, Dr. Diamond simply did the work and followed where her curiosity led her, bringing about a paradigm shift in the process. As she points out, in order to get to the answers that matter, you have to start by asking the right questions. MY LOVE AFFAIR WITH THE BRAIN provides an excellent introduction to the brain, to science and the scientific method itself, to the essence of teaching and education, and to the pleasures of a life well lived in science. "This movie is fantastic and tells one of the most inspiring stories in modern neuroscience. It presents such a good message of a woman in a man's field plowing her own way. I would love for all kids to watch it...So inspiring, such a moving story, and what a fabulous way to tell it! " "This film, like Marian Diamond herself, is an inspiration. It is a loving tribute to a mentor and researcher who, through her academic curiosity and intellectual generosity, has opened the doors of neuroscience to millions of individuals around the world." "Highly Recommended...Exceptional...The film captures the significance of the role women play in science, using Dr. Diamond as an example. This is a 'must have' film for libraries supporting programs in neuroscience, psychology, cognitive science, and biology." "Marian Diamond has made two major contributions to Neural Science that have stood the test of time. First, she has documented the dramatic consequences on brain development of an impoverished environment compared to an enriched one. Second, she has developed a new way of teaching students about the anatomy of the brain that is both highly original and very exciting. Bravo!" "A must see for every student, teacher, parent, community member, and higher education teacher prep program!" "Science has a soul, an intangible passion of the human spirit driven by wonder and delight...My Love Affair with the Brain reveals the soul of science through the remarkable life of Marian Diamond. Her passion to explore the brain, her keen insights into how it responds to our experiences, and her drive to share her enchantment and discoveries with a new generation shines in this inspirational documentary." "A must see movie for anyone with a curiosity about the brain and the history of brain science." 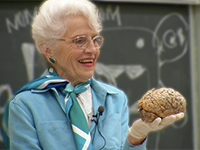 "Thrilling and inspiring...The film shows how she was such an incomparable teacher and mentor to generations of students and how she was among the first to demonstrate the incredible plasticity of the brain." "A brilliant, buoyant, enlightening and beautiful film that achieves just the right balance between the 'personal' and the 'scientific.'" "I just did something great for my brain and you can do the same, with the documentary My Love Affair With the Brain...Narrated by actress Mayim Bialik, the film details in understandable terms how Diamond determined that brains do better in 'enriched' environments than in impoverished ones, and, through studies of four pieces of the brain of Albert Einstein, found a previously undiscovered role for parts of the neurosystem known as glial cells. Diamond really has a love affair with the human brain, and through this joy-filled film, it's highly contagious." "Marian is a scientist, a woman, a mother, a friend, a wife, and so much more because she is comfortable in all of those identities. She taught me by example that it is not only ok to wear pink in the lab, but to do so with pride." "Should be required viewing for all students and professionals in gerontology, geriatrics, and adult development and aging. It offers an intimate introduction to Dr. Marian Diamond...The film has high relevance for students of science in general, especially those interested in scientific revolutions." "A wonderful film about an amazing scientist and an extraordinary teacher. As a teacher trainer in the Department of Applied Linguistics at UCLA for over twenty years, I strongly urge college/university teacher training programs across the country to use this film as an example of effective classroom instruction for future secondary and post-secondary teachers." "Marian Diamond is to the brain like Julia Childs is to French cooking. Celebrated, beloved, one of the most popular teachers in the world brings you her passion about the brain. The film is a personal story about the thrill of discovery and drive of curiosity. A brain owner's manual." "Any library would be well served to have this in their collection." "This film is not only an important archive of the history of Marian Diamond's ground-breaking work during a time when very few women could be found in the upper echelons of science, but it also is a reminder of how one person can have a profound effect on enhancing knowledge and the quality of life across the globe." Rachel Carson's love for the natural world and her fight to defend it. Why are some of us good at finding our way, while others are not? The latest findings in spatial cognition research have multiple implications including for urban planning and design. The odds are against girls getting an education in Zimbabwe and throughout much of Africa. 10-part series in which five scientists on a tropical island cooperate to solve a series of scientific challenges using only their knowledge, ingenuity, and whatever is at hand. With nanotechnology medicine could evolve from treating disease to a practice that is predictive, personalized and preemptive. "Working successfully in science is in some part about finding the questions that awaken your passions for discovery and truth. As this wonderful documentary attests, it is also about how you work with others to ask the question in a way that is answerable...Marian was a wonderful person because in the face of the sexism of the mid-20th century science community, she persevered in her ability to share her love of science." "Catherine Ryan and Gary Weimberg succeed marvelously in their goal 'to explore the achievements of Dr. Marian Diamond's life and her science.'" "Energetic documentary...Watch this to learn about an amazing woman, a brilliant scientist, a fascinating branch of scientific research, and about the core element that fuels great achievement in all endeavors: love." "An engaging portrait of a neuroscience pioneer, this is recommended." "We are the masters of our own mind! Choose your diet wisely, exercise, accept a challenge, experience something new, and do it all with love...My Love Affair with the Brain is an exquisite chronicle of her research and teaching...Her love affair with the brain continues!" "A solid biography of a working scientist who can be a role model for us all but especially for young women interested in a career in scientific or medical research." "Highly Recommended...Inspirational and educational...From the women in her classes and those interviewed, it's clear she's inspired new generations of women in science. The film shows us an optimistic take on how the scientific community can continue to make progress on being open to everyone with a good idea and a love of finding out how the world-and the mind-works."